There are several other cities that have made a claim as to being at either the geographical center of the United States or at the geographical center of North America. 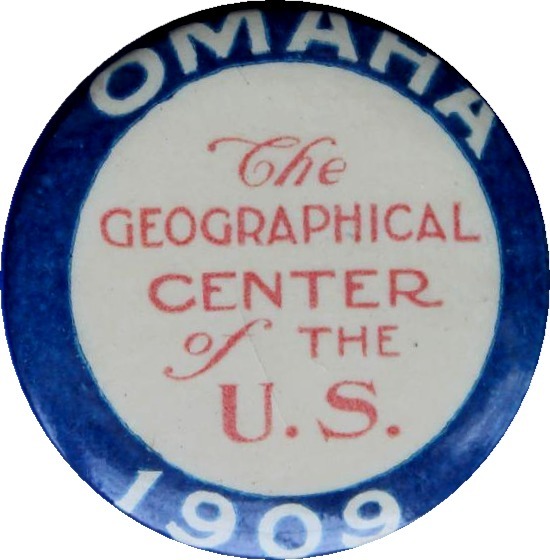 The list could include many others, but here are a few that openly promoted themselves as being the geographical center. This city is located 50 miles east of the Geographical Center monument at Lebanon, Kansas. Their claim came near the end of the era for Smith Center and just before the designation at Lebanon. 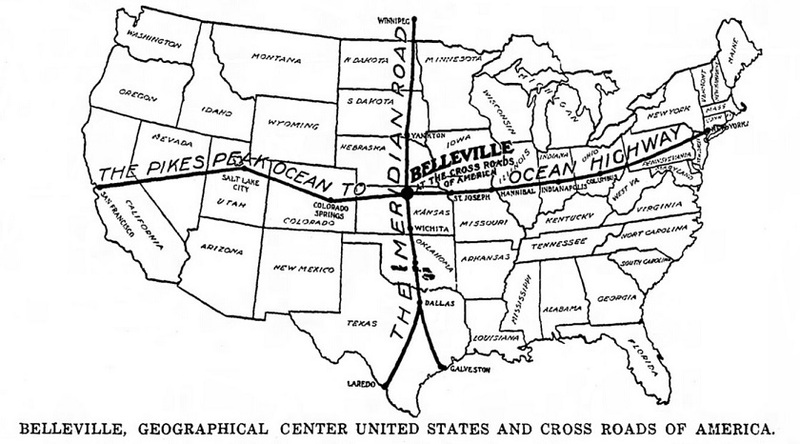 This map was published in the Belleville Telescope on May 27, 1915. This newspaper article inexplicably began appearing in newspapers across the country in June of 1969 and lasted until around December of that year. 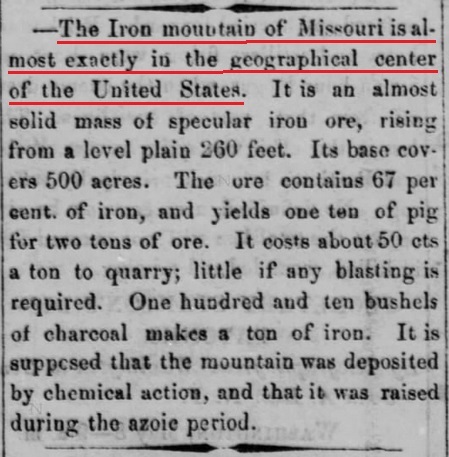 While the headlines seems to indicate the center of the United States, the text mentions that portion west of the Mississippi River. This peak is located near the British Columbia/Alberta boundary approx. 160 miles northwest of Calgary. It is known as the highest point in Alberta at 12,294'. 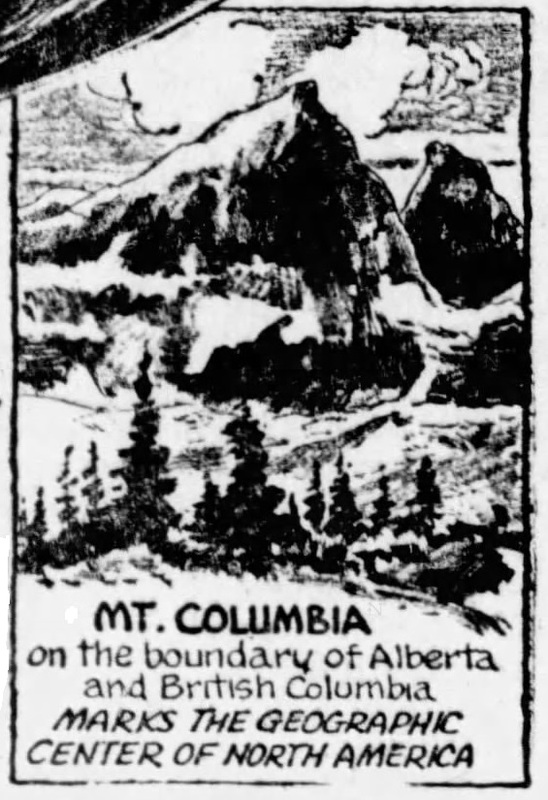 The distinction for being at the Center of North America appears to have first come in late 1942, and then was sporadically mentioned in newspapers until at least September 14, 1957, when it was named in a "Ripley's Believe It Or Not" column (shown above) across the United States. This location is by far the most western claim for the Center of North America. Battle Creek Enquirer (Michigan) - December 16, 1942. The Indiana Gazette - January 19, 1951. The New York Age - May 22, 1954. Iron Mountain is an unincorporated community in St. Francois County, Missouri, approximately 65 miles south of St. Louis. The community was named for nearby Iron Mountain which early settlers once thought was made completely of iron ore. This article appeared in several newspapers between April-June 1864. The designation at Omaha was the result of the Omaha Commercial Club promoting their city and needed something to draw attention. The 1909 date is in the era where no one really knew that Smith Center, Kansas, had been designated. Omaha is 170 miles northeast of the monument at Lebanon, Kansas. This city is located 18 miles north of the monument at Lebanon, Kansas, so their claim was not that far off. The designation first appeared on the heading of the local newspaper, The Red Cloud Chief sometime before September of 1903, and ceased on December 4, 1903. (Issues of The Red Cloud Chief are not available between January and August of 1903, so the exact date that this heading began is unknown). 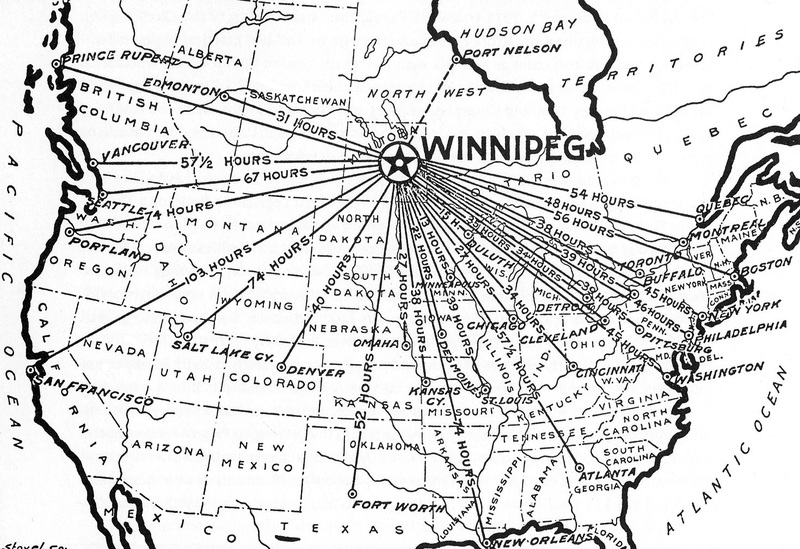 Winnipeg, Canada, is located 170 miles northeast of Rugby, North Dakota. Due to the uncertain boundary of the northern region of North America, it would be easy for this large city to see themselves as the center of North America. Promotion was mainly limited to trying to attract industry and included this promotional map. The above small 10 word brief first appeared in United States newspapers during the summer of 1949 and was apparently used to fill small column gaps into the beginning of 1951. The reason for this statement is unknown since Rugby, North Dakota, had already solidified the title for nearly two decades. 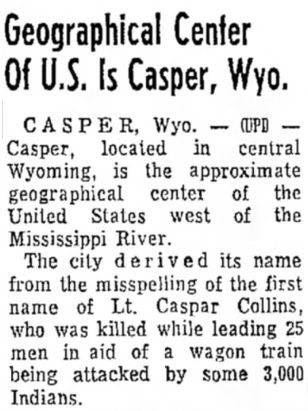 This article appeared in the Huron, South Dakota, newspaper, The Evening Huronite, on November 6, 1935. 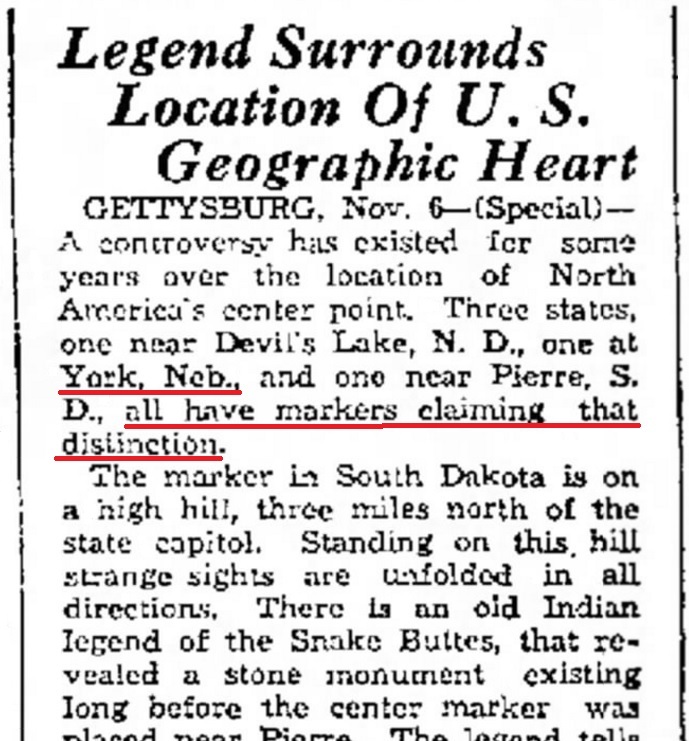 The text implies that there is a marker located at York, Nebraska for the Geographical Center of North America, but does not further mention what it is or exactly where it was located. I can find no other mention of a marker ever being at York, Nebraska.